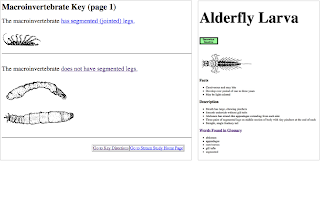 After talking to experts about the different tools used to learn about and identify macroinvertebrates, we put together a collection of seventeen interesting and representative tools. For each tool we compared the information provided, the expected usability (we did not test all the tools, only provided our opinion), the intended user group. 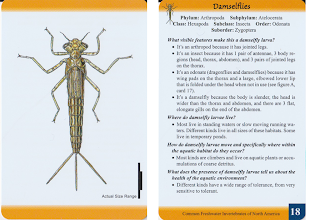 We found a number of interesting interactive and print tools both to learn more about macroinvertebrates and identify the insects in the field or in a lab. Looking at a wide variety of tools helped us understand the level of detail necessary for our tool. It helped us understand how different publishers organize information, and what features may be particularly useful to users. For example, we found that many ID tools forgo the dichotomous key in favor of a pallet of images or illustrations, making it easier for novice users to look for a visual match, rather than trying to answer a number a questions. 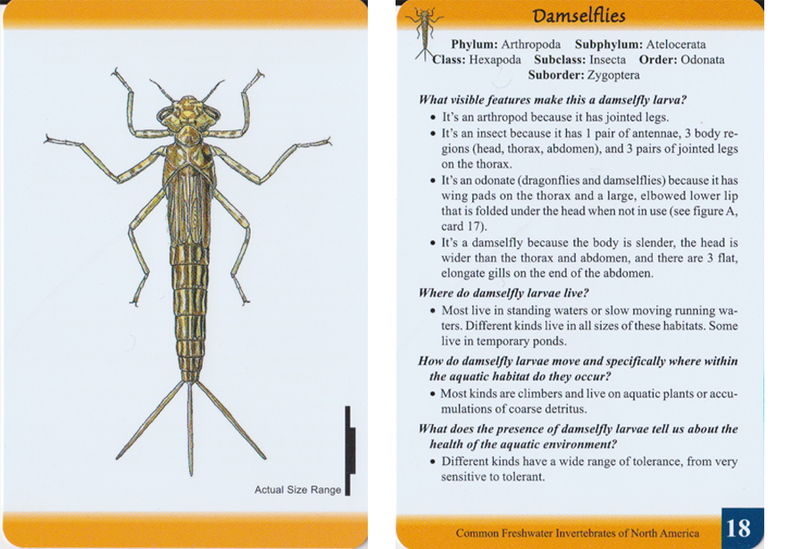 These flashcards provide a great overview. 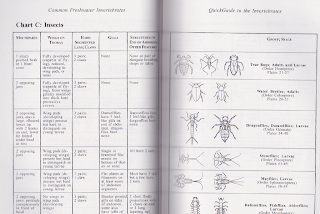 The clear illustrations are particularly effective because they illustrate the distinct characteristics of each insect.We also really like the “Actual Size Range“ indicator. It put the insects into perspective and is more effective than a written size range (e.g. 3mm-12mm). The written content on the back of the cards could be more clear if it was written as simple bullets rather than full sentences. 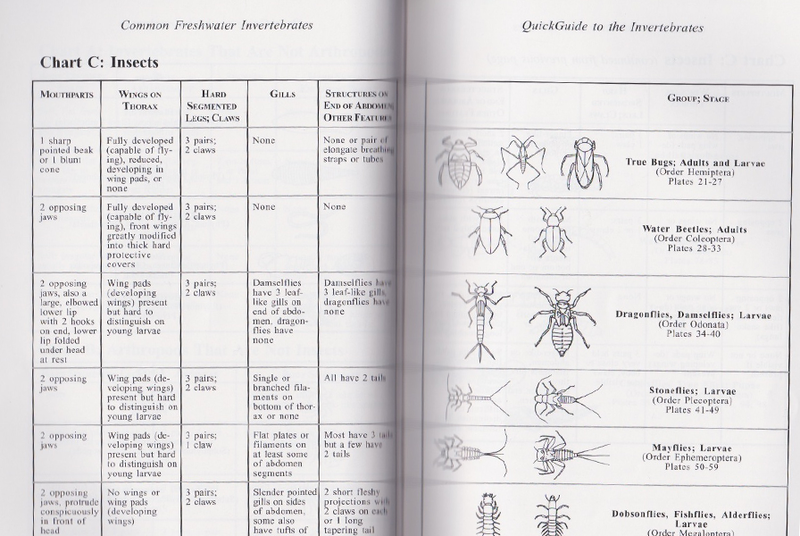 This is a broad book that includes a key as well as guides of how to correctly collect and identify macro-invertebrates. The writing seems dense, but the key and details seem pretty high level, making it difficult to say exactly who the audience of this book is. 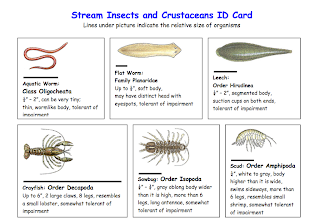 I expect that it would be used by a professional, non expert, entering the field, wanting an overview of macro-invertebrate collection, identification and stream health monitoring process. This online dichotomous key is very simple, but effective if the user understands the language and knows what they are supposed to be observing. However, for a very novice user, it may be difficult to use. There is no way to change answers from previous pages without moving backwards through the pages, so if you reach the end of the key and have the wrong answer, you have little choice but to start over. 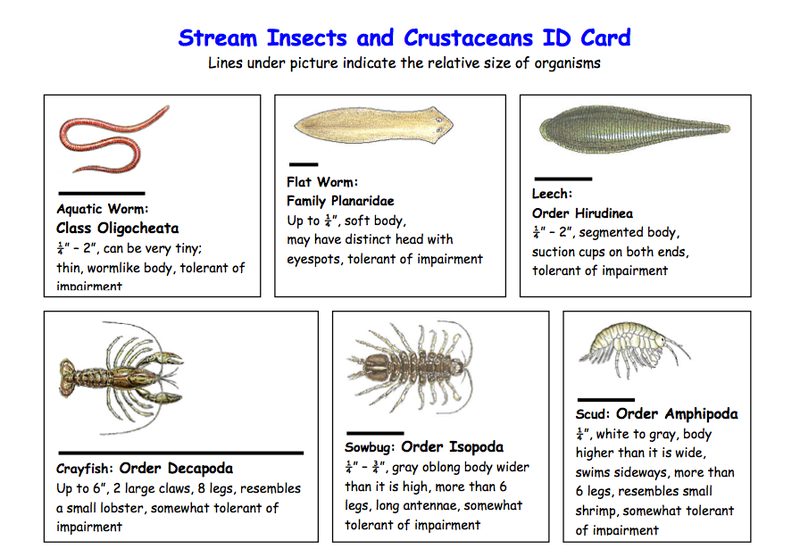 This ID card gives a nice broad overview of aquatic insects. 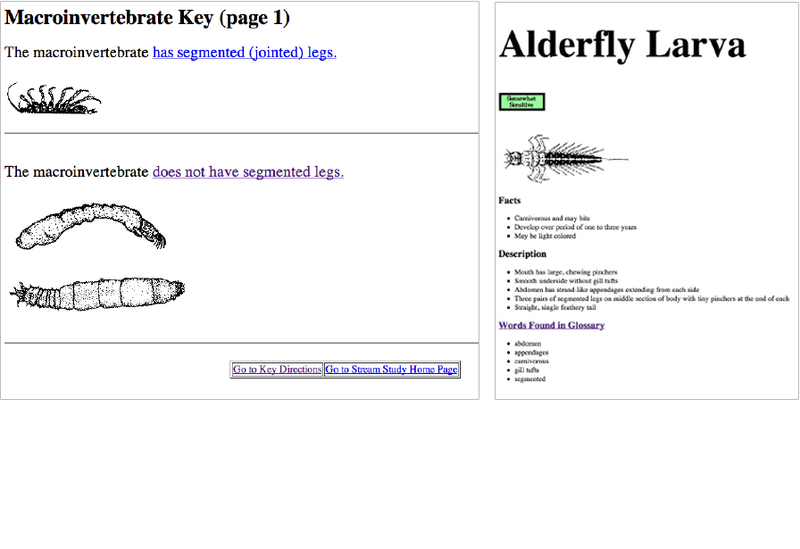 The information it gives is very limited, and the images small, but it seems like an effective ID tool. Rather than a key that most ID tools use, this is just a pallet of illustrations on two 8.5x14” sheets of paper. For novice users, this is likely the most effective way to ID orders, just searching for the image that most closely matches. The information is simple, but appropriate for this pallet. More information would have taken up too much space and forced this to be a longer document, making it less effective.